Representative Honours: Ireland: 12 Full Caps / 2 Goals (1910-1914), 3 Amateur Caps (1906-1910), Junior; Irish League: 3 Caps (1908-1909). Club Honours: (with Cliftonville) Irish League Champion 1909/10; Irish Cup Winner 1908/09, Runner-Up 1909/10; (with Linfield) Irish League Champion 1910/11; (with Bradford City) FA Cup Winner 1910/11. 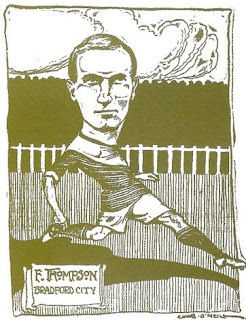 Frank Thompson made his name as an amateur with Cliftonville. While with the Reds the flying winger gained Irish League and Cup medals and a plethora of representative honours. The first of three Ireland Amateur caps was won in a 2-1 defeat by England in Dublin in December 1906. He also played three times for the Irish League, each match resulting in defeat. In 1909 he was a member of the Cliftonville side that claimed the Irish Cup, with a 2-1 Final replay win over Bohemians, and the following year claimed an Irish League winner’s medal but missed out on the “Double” following a Cup Final defeat by Distillery. Thompson won the first three of his twelve Full Ireland caps while with Cliftonville, and he got off to a flyer at international level. His debut, against England in Belfast at Solitude in 1910, brought a goal as the Irish led 1-0 at half-time only to be pegged back to 1-1 in the second-half. His second cap against Scotland a month later brought another goal, and an even better result as the Scots suffered a 1-0 defeat on their first ever visit to Windsor Park. The run came to an end at Wrexham as Wales cruised to an easy 4-1 win to deny Ireland their first outright Home Nations title. Early in the 1910/11 season Thompson made the move to professional status with Linfield, helping the Blues to regain the Irish League title that they had surrendered to Cliftonville the season before. His stay at Windsor Park was brief, though it did bring a fourth cap in another defeat to Wales, before he moved moved to Bradford City. In his first campaign the Ballynahinch-Bantam helped his new club to an FA Cup success. He scored two goals on the way to the Final, including the winner in a fourth round game against Burnley that attracted a record 39,146 attendance to Valley Parade. The Final, played at the Crystal Palace, finished goalless against cup-holders Newcastle United. In the replay, held at Old Trafford, Thompson set up the only goal in a 1-0 win so giving the Bantams their only ever Cup win. In May 1913, three months after featuring in Ireland’s first ever win over England, Thompson joined Scottish First Division side, Clyde. It was an association which was to last 21 years as a player then manager. In the years that preceded Thompson’s arrival Clyde had been a solid top-half side, but by the immediate post-War seasons they were obviously a club in decline and had started to slip down the table. 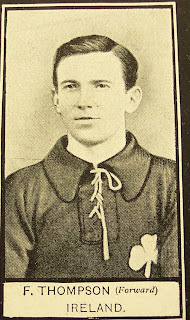 It was while with the Bully Wee that Thompson won his final two caps in what would become an historic 1914 British Championship campaign for Ireland. Having been overlooked for the opening win over Wales (Bradford City’s Louis Bookman an ironic replacement), Thompson came in for the 3-0 win over England at Middlesbrough – Ireland’s first victory on English soil. He retained his place for Scotland’s visit to Windsor Park and, in a match mixed with both farcical muddy playing conditions and the adversity of losing ‘keeper Fred McKee to injury, Ireland attained the 1-1 draw required to claim their first outright Championship success. As the Scottish League continued largely unhindered through the years of the Great War Thompson did not feature at all from 1915/16 to 1918/19. He returned when hostilities ceased and helped Clyde battle against relegation until their almost inevitable fall into Division Two in 1924 and Thompson decided to hang-up his boots. He had taken the managerial reigns at Shawfield in 1922, but following relegation the turn-around in the club’s fortunes was rapid. In 1925/26 Clyde not only attained promotion back to Division One as runners-up to Dunfermline, they also won the Glasgow Cup, defeating Celtic 2-1 in the Final. Thompson kept Clyde in the top-flight of Scottish Football until he left the club in 1934. Thompson took the managerial job at Ayr United in January 1935 and helped them narrowly avoid relegation from the First Division in his first season. The club did succumb to the drop the following year but once again Thompson proved the bounce-back king, leading The Honest Men to the Division Two title in glorious fashion. Ayr made steady progress back in top-tier football, but on the suspension of the Scottish League at the outbreak of World War Two they temporarily folded and Thompson was out of a job. 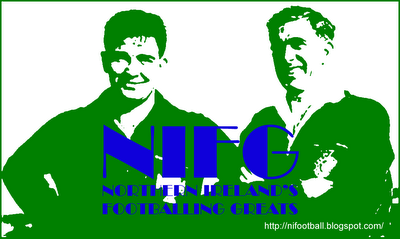 He returned to Ireland to become manager at Glentoran in December 1945, a position he held until 1947. He then moved back to Ayr where he died in October 1950. Summary: 12/2. Won 4, Drew 2, Lost 6.